Reviewing OpenStreetMap contributions 1.0 – Managed by changeset comments and discussions? : Neis One! However, one year ago, almost to the day, I wrote a blog post about a webpage for detecting suspicious OSM edits. In the newly updated version, I would like to combine the aforementioned changeset discussions and comments about suspicious edits to communicate with members in a more direct way. The following image shows the revised webpage. Furthermore you can request all changesets of a contributor, which have been commented on. The same page can also show all comments written by a selected contributor (with all comments of the particular changeset). I think the last both features are really helpful for keeping control over your own and other changeset discussions. 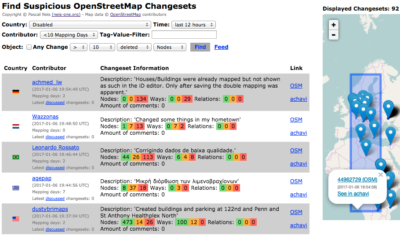 This should also simplify the reviewing process of changesets and map edits. As mentioned at the beginning of this blog post, some OSM groups send a welcoming e-mail to new contributors. I also saw that some mappers are welcoming new members in Taiwan with a changeset comment and information on their first changeset. Pretty neat stuff if you ask me. One minor nit-pick: When opening the page for a specific country (e.g. http://resultmaps.neis-one.org/osm-discussions?c=Australia), another country (Zimbabwe) is pre-selected in the list. Also, the map could be zoomed to the respective country, right? Hi Martin, thanks for your comment, both should be fixed now. Very helpful and quite intuitive to use. And finally a listing of all comments written by a selected contributor – excellent work! Hi poppei82, thanks for your comment. Totally agree, the mentioned (Geman) forum thread is quite useful!